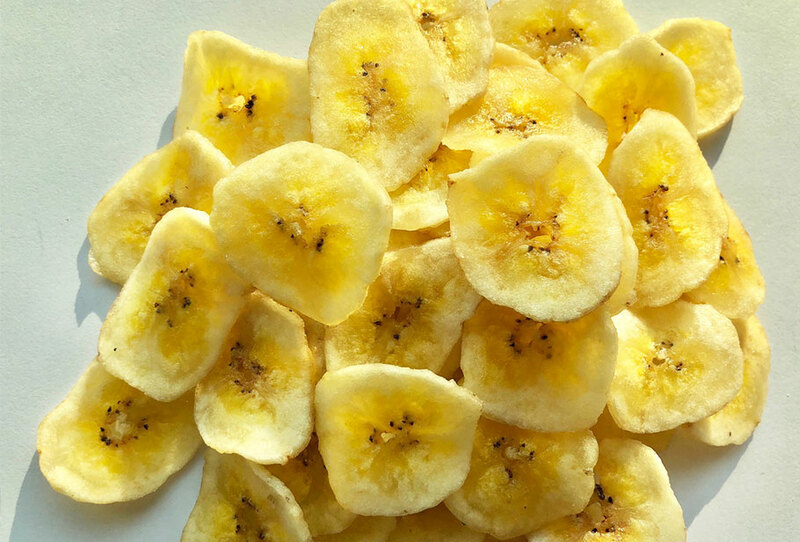 Round sliced banana chips made from properly selected, mature green bananas, “Saba” variety, dipped in sugar syrup solution and fried in coconut oil with added natural banana flavor. Packed in heat sealed High Density Polyethylene bags (HDPE) and cased in corrugated carton boxes. Weight per pack depends on customers’ requirement. 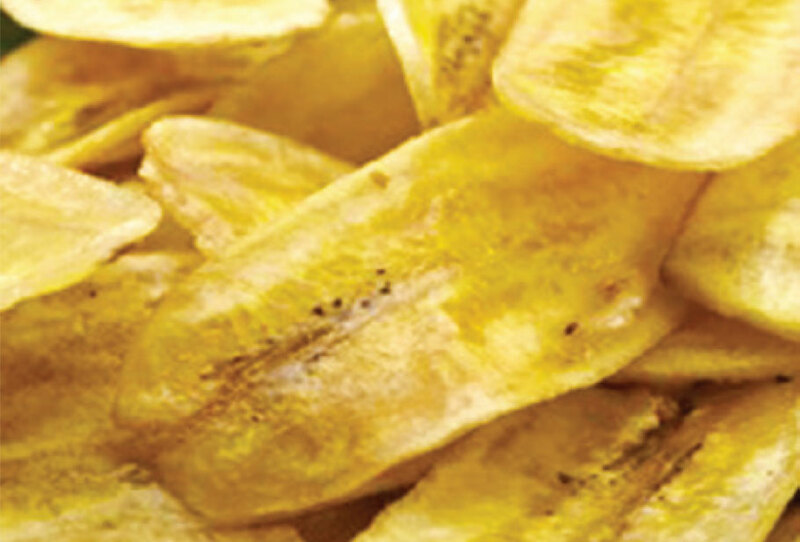 Broken slices of banana chips made from properly selected, mature, green banana, “Saba” variety, dipped in sugar syrup solution and fried in coconut oil with added banana flavor. Long cut sliced banana chips made from properly selected, mature green bananas, “Saba” variety, dipped in sugar syrup solution and fried in coconut oil with added banana flavor..
Quarterly-sliced banana chips made from properly selected, mature, green banana, “Saba” variety, dipped in sugar syrup solution and fried in coconut oil with added banana flavor. 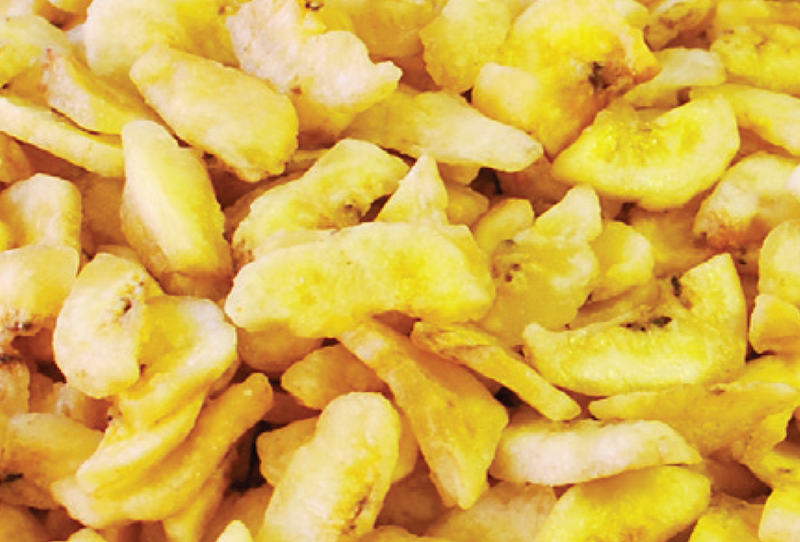 Slanted round sliced banana chips made from properly selected, mature green bananas, “Saba” variety, dipped in sugar syrup solution and fried in coconut oil. 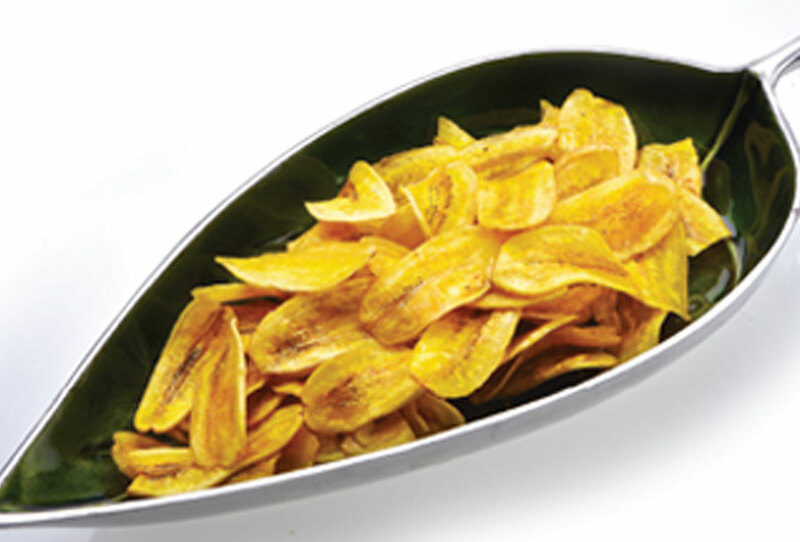 Thin round sliced banana chips made from properly selected, mature green bananas, “Saba” variety, dipped in sugar syrup solution and fried in coconut oil with added banana flavor. Packed in heat sealed High Density Polyethylene bags (HDPE) and cased in corrugated carton boxes. Weight per pack depends on customers’ requirement..
Our Coconut Cream comes from the fresh white flesh of mature coconuts. It is highly nutritious and rich in fiber, vitamins and minerals. It has a good source of natural fat for the body. It consists of lauric acid which is antibacterial, antifungal and antiviral. Coconut milk helps to boost your immune system and to keep the arteries of the heart clean and healthy. 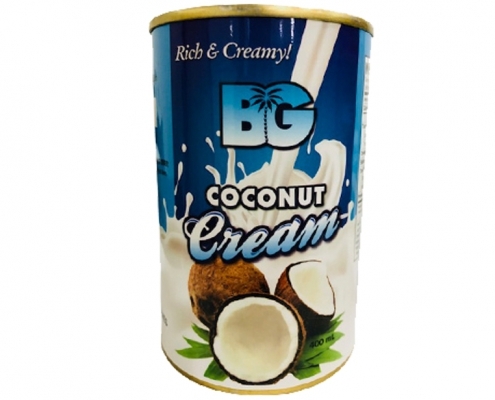 Our Coconut Cream has a higher fat with thick consistency and a rich, flavorful and creamy texture which is used in desserts and thick sauces. Made from hand-picked, extracted from freshly harvested mature organically grown Philippine coconuts with low moisture content. No micro-sediments, no rancid odor, guaranteed fresh, no artificial flavoring, no preservatives, no hydrogeenation, trans fat free, not refined, not bleached, not deodorized oil. Our Low Fat Coconut Flour are made from selected coconut meat and dried, with a natural, mouthwatering coconut flavor and with no off-odor. They are delicious, healthy and adds a coco nutty aroma to any dish and desserts, making it a naturally flavorful ingredient for cooking and baking. 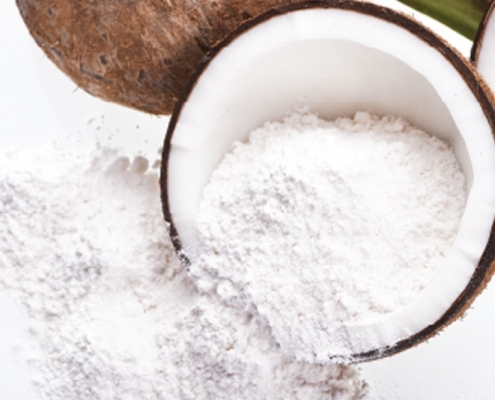 Our Low Fat Coconut Flour are a healthy alternative to wheat and grains. They are high in fiber, lower digestible carbohydrates, and a good source of lauric acid, hypoallergenic and gluten-free. They provide many health benefits and supports the immune system, helps prevent heart disease and promotes good health. Our Coconut Milk comes from the fresh white flesh of mature coconuts. It is highly nutritious and rich in fiber, vitamins and minerals. It has a good source of natural fat for the body. It consists of lauric acid which is antibacterial, antifungal and antiviral. Coconut milk helps to boost your immune system and to keep the arteries of the heart clean and healthy. 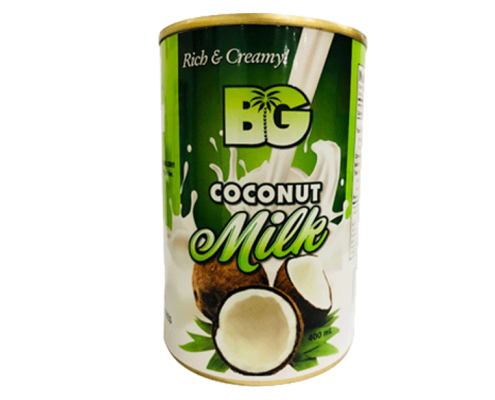 Our Coconut Milk has a thin consistency with a low fat content which is used in beverage, soup and thin sauces. B-G Fruits and Nuts Manufacturing Corporation was established in 1991. Since then it has manufactured and marketed products which have been successfully introduced and accepted in global markets. Its manufacturing plant nestled in the heart of banana plantations in resource-rich Mindanao, south the Philippines thereby fulfilling their raw material requirements with all-natural freshness. Its operations comply with Good Manufacturing Practices (GMP) and adhere to the Food Safety Management System based on Hazard Analysis and Critical Control Point (HACCP). 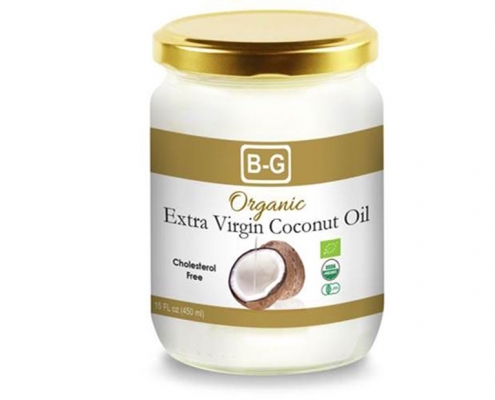 B-G’s professionalism and commitment to food safety and high quality have earned the loyalty of its growing clientele, have resulted in one of the best-selling products brands in the USA, Europe, Asia-Pacific and the rest of the world. We have reliable and fresh raw materials sources, competent management and staff, appropriate technology, modern laboratories for product research and development and testing, warehouse and transportation facilities, adequate shipping arrangements, and a wide marketing network of our customers, suppliers and employees. For more than two decades now, our food products have consistently been recognized and loved all over the world. All our operations strictly comply with Good Manufacturing Practices (GMP) and the Hazard Analysis Critical Control Points (HACCP) Quality System. Because we manufacture our products according to the highest industry standards, their superior food quality and taste are guaranteed. Our business ethics and commitment to our partners and clients made us one of the best-selling brands in the United States of America, Europe, Asia and the Pacific. Food safety and superior food quality have always been our core principles. 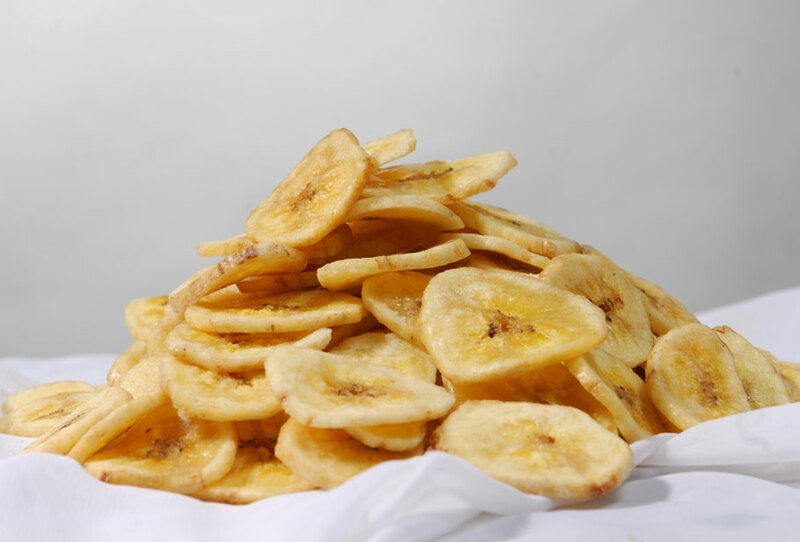 We are committed to be the leading organic and non-organic banana chips, extra virgin coconut oil, coconut flour and other coconut products manufacturer and exporter in the Philippines..
We guarantee our customers’ satisfaction with all our products by using only the freshest, naturally-grown bananas and coconuts. 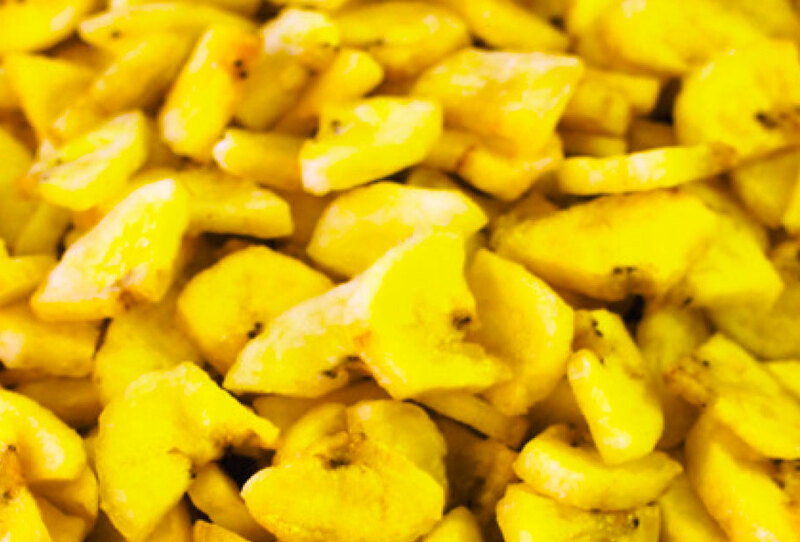 We pride ourselves in our advanced manufacturing plants and banana and coconut plantations located in Mindanao, Philippines. We use innovative technologies and laboratories for product research, development and testing.